Download "Illinois Compiled Statutes. HIGHER EDUCATION (110 ILCS 1005/) Private College Act." 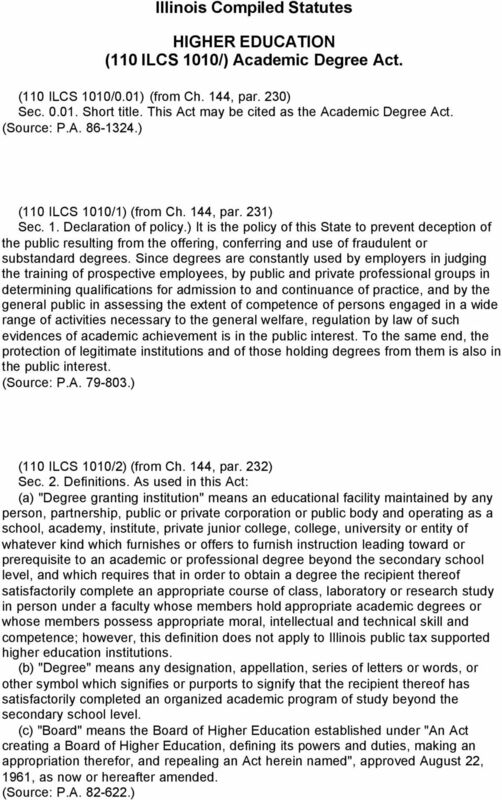 1 Illinois Compiled Statutes HIGHER EDUCATION (110 ILCS 1005/) Private College Act. 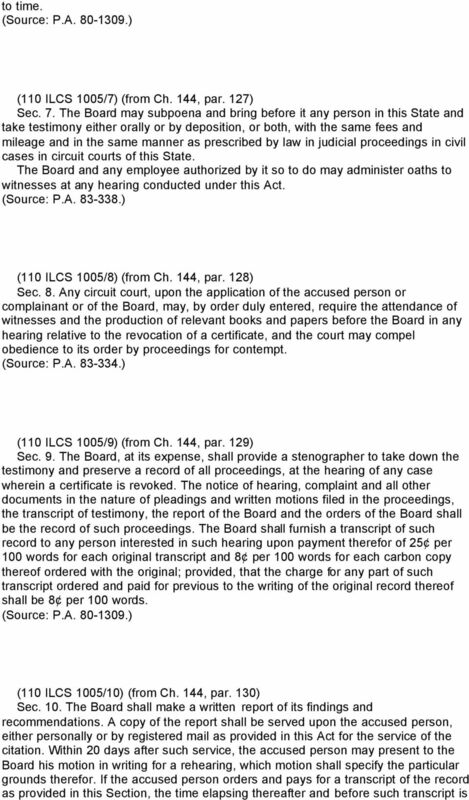 (110 ILCS 1005/0.01) (from Ch. 144, par. 120) Sec Short title. This Act may be cited as the Private College Act. (Source: P.A ) (110 ILCS 1005/1) (from Ch. 144, par. 121) Sec. 1. For the purposes of this Act: "Post-secondary educational institution" means a privately-operated college, junior college or university offering degrees and instruction above the high school level either in residence or by correspondence. 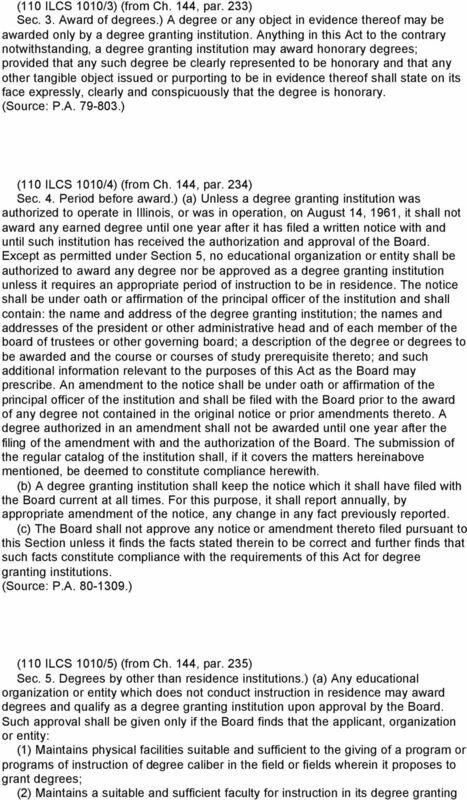 "Board" means the Board of Higher Education established under "An Act creating a Board of Higher Education, defining its powers and duties, making an appropriation therefor, and repealing an Act herein named", approved August 22, 1961, as now or hereafter amended. "Degree" means any designation, appellation, series of letters or words, or other symbol which signifies or purports to signify that the recipient thereof has satisfactorily completed an organized academic program of study beyond the secondary school level. (110 ILCS 1005/2) (from Ch. 144, par. 122) Sec. 2. 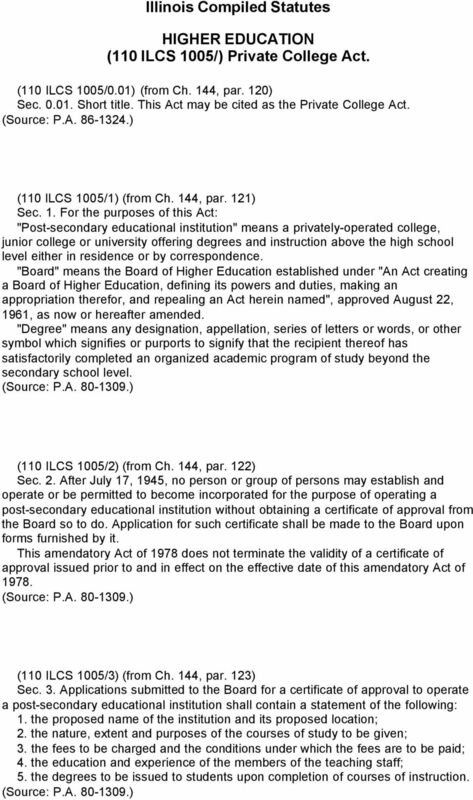 After July 17, 1945, no person or group of persons may establish and operate or be permitted to become incorporated for the purpose of operating a post-secondary educational institution without obtaining a certificate of approval from the Board so to do. Application for such certificate shall be made to the Board upon forms furnished by it. This amendatory Act of 1978 does not terminate the validity of a certificate of approval issued prior to and in effect on the effective date of this amendatory Act of (110 ILCS 1005/3) (from Ch. 144, par. 123) Sec. 3. Applications submitted to the Board for a certificate of approval to operate a post-secondary educational institution shall contain a statement of the following: 1. the proposed name of the institution and its proposed location; 2. the nature, extent and purposes of the courses of study to be given; 3. the fees to be charged and the conditions under which the fees are to be paid; 4. the education and experience of the members of the teaching staff; 5. the degrees to be issued to students upon completion of courses of instruction. 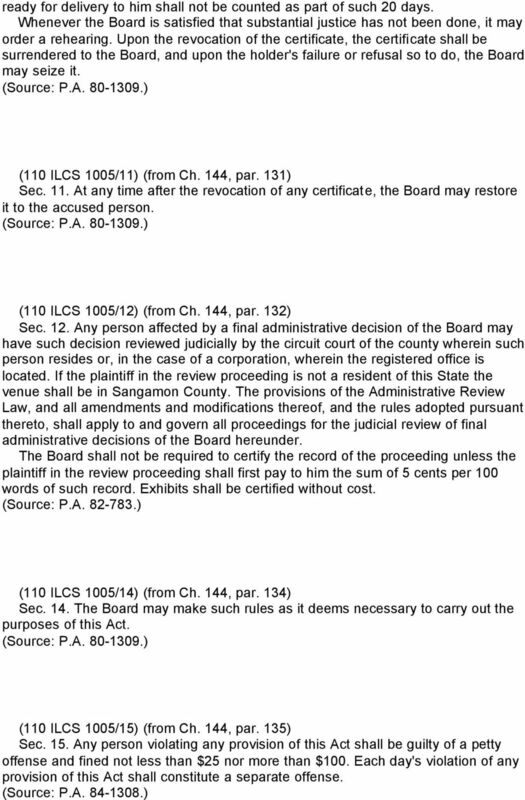 776 LAWS OF PENNSYLVANIA, Section 706. General Repeal. 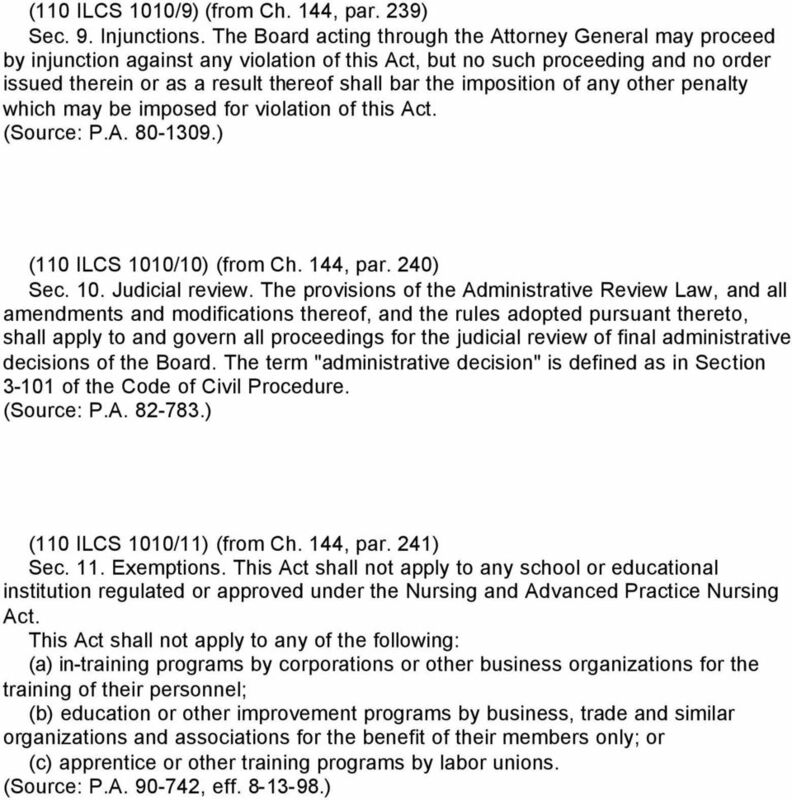 Al1 other acts and parts of acts are repealed in so far as they are inconsistent herewith. APPROVED The 17th day of July, A. D. 1961. The County Code. 116-15. 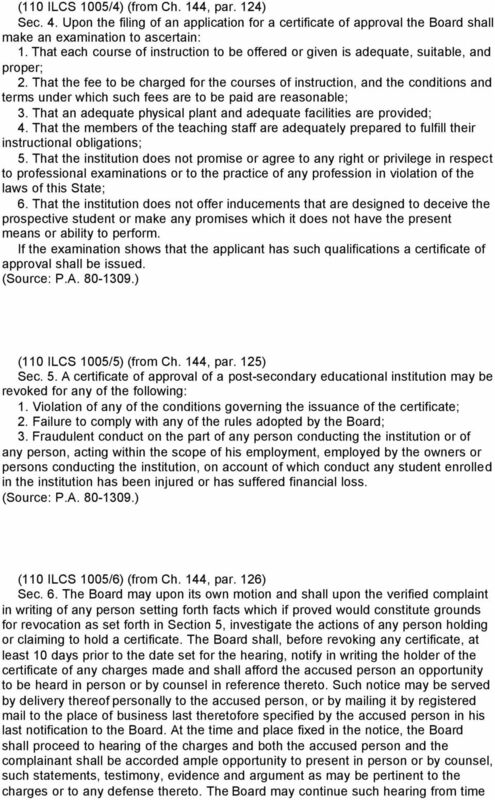 Licensing of certain nonpublic post-secondary educational institutions.